The toasted honey-brown hues of our Western Sunburst top lend neo-vintage aesthetic appeal to this rosewood/Lutz spruce Taylor Dreadnought. The Lutz top revs up the tonal output — it rivals the dynamic response of an Adirondack spruce top — while the rosewood back and sides contribute a warm low end balanced by strong treble shimmer. 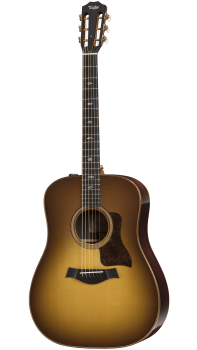 The neck sports a unique feel for a Dreadnought, thanks to the slightly shorter 24-7/8-inch scale length and slotted headstock, which translate into a slinkier, more intimate playing experience. It makes bending strings a joy and invites singer-songwriters up the neck. Another subtle distinction, a V-carve neck profile, largely retains Taylor’s sleek profile with a slightly thicker dimension that might appeal to fans of traditional Dreadnoughts. Warm aesthetic details include koa binding, a herringbone-style rosette featuring Douglas fir with maple/black accents, bias-cut Douglas fir top trim, a “Reflections” fretboard inlay in pale green abalone, and a “weathered brown” pickguard. Taylor’s onboard ES2 pickup and preamp wire the guitar for a natural-sounding plug-and-play experience.